CARMEL, CA--(Marketwired - Mar 24, 2015) - The Santa Lucia Preserve (The Preserve), a majestic private community of only 300 homesites situated on 20,000 acres approximately the size of Manhattan, is the only community with a perpetually endowed 18,000 acre nature conservancy supporting a rich mosaic of coastal habitats. Globally recognized as a great biodiversity "hotspot," it's one of only six found in the United States. For its residents who embrace a variety of lifestyles and ages, The Preserve reflects a unique blend and ethos of community, culture and conservation. The Preserve, nestled in the Santa Lucia Hills in Carmel on the Monterey Peninsula, California, was originally created to honor the land and host estate homes for individuals and families seeking an authentic and distinctive lifestyle in nature. A value system shaped by vast open spaces, abundant biodiversity, privacy and a sustainable approach to development (the development footprint comprises only 2,000 acres, leaving 18,000 acres under conservancy protection) makes The Preserve in high demand among those who have realized a certain success, identify with these virtues and seek an ultra-coveted way of life. A world apart, yet not a world away, The Preserve, a gated community, boasts close proximity to Carmel (just three miles) and Pebble Beach (seven miles) contributing to its luster and convenience. Easy access to one regional and three major airports: Monterey Regional Airport, San Jose International Airport, Oakland International Airport and San Francisco International Airport makes getting to The Preserve an easy escape. The Preserve is a haven for both full-time residents and seekers of an exemplary second home. The 300 homesites and an exquisite collection of award-winning homes built by owners are priced between $4 and 14 million; green design and sustainable building are highly encouraged. The Preserve provides an ideal retreat for multiple generations of families to marvel at the delicate balance of constancy and change, as old memories are remembered and new memories are made. Life at The Preserve offers an approach to day-to-day living that provides a true connection with the natural world in community, ideal for families and couples, combined with modern conveniences and high-end amenities. Besides offering privacy in nature, The Preserve invites owners to create an authentic, rich life in a bespoke manner suited to a variety of proclivities. Homeowners and their guests can enjoy 100 miles of hiking, biking and equestrian trails with access from every door as well as the amenities of two private clubs: The Preserve Ranch Club and The Preserve Golf Club. The Preserve Ranch Club facilities include a premier multi-discipline Equestrian Center, two private dining venues (Hacienda and Polo Pools), three swimming pools, a water slide, a hot tub, two hard tennis courts, two har-tru clay tennis courts, a Bocce court, a croquet court, an enclosed batting cage, a horseshoe pit, bikes and a state-of-the-art Sports Center (fitness center with a wide variety of equipment and classes). The Hacienda, a 1920s Spanish Colonial masterpiece, is the heart of The Preserve Ranch Club and serves as the community social center, hosting regular entertainment and culinary events. Members may utilize lodging for guests, which include nine rooms in The Hacienda and seven rooms in The Grays' Ranch House, ideal for family gatherings and reunions. Members and guests may luxuriate around The Hacienda pool, heated May through September. The Equestrian Center, open to riders of all disciplines and skill levels, offers three center-aisle barns with 30 owner stalls, a 150' x 260' main arena, a regulation dressage arena, a training round pen, an exercise track and a dozen irrigated pastures for daily turnout. Full board is offered with daily care, exercise and 24-hour attention. Several homesites also allow self-care boarding. Covering 365 acres, The Preserve Golf Club is home to a distinguished golf course designed by Tom Fazio, Mike Poellot and Sandy Tatum. Golfers can experience breathtaking views, the natural landscape and a challenging course, named one of America's Greatest Golf Courses by Golf Digest Magazine. A round of golf in The Preserve's serene setting resembles a trail walk, amidst the splendor of valley and coastal live oaks, coastal redwoods and sycamore trees. The exclusive Preserve Golf Club membership provides full access to all Preserve Golf Club facilities and access to participate and attend all Preserve Golf Club events throughout the year. 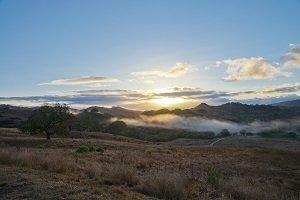 "For individuals and families seeking to step away from the rattling pace of today's world dominated by media screens and noise, The Preserve beckons with a different kind of stimuli," said Mike Kelly, Chief Operating Officer of the Santa Lucia Preserve. "Imagine the call of red-tailed hawks, a glimpse of a gray fox and the perfume of wildflowers. At The Preserve, the abundance of the natural world is met with premium modern amenities creating an ease of living and a distinctive feeling of community and reverence for what is most meaningful," continued Mike. The Preserve presents a slice of historic California ranch life with a thoughtful approach to stewardship of this resplendent land. The Santa Lucia Conservancy takes exceptional pride in protecting the land and the flora and fauna native to The Preserve Exploration of the vast open space and wooded glens reveals the natural inhabitants, such as wild turkeys, foxes, deer, rabbits, wild boars and a plethora of bird life soaring in the skies above. The perpetually-endowed non-profit land trust's Board of Governors represents scientists, conservation experts and Preserve landowners, and focuses mainly on three key areas: preservation, research and education. Supporting this mission, the Conservancy's efforts include a) safeguarding the health of the land, b) engaging in scientific endeavors to inform this effort and c) sharing that knowledge with residents and other members of the public to sustain a multi-generational commitment to its well-being. As part of the latter, the Santa Lucia Conservancy educates 3,000 local school children annually. The Preserve makes for an unforgettable and exclusive wedding and corporate retreat venue with its stunning and private natural backdrop. As The Preserve is a private community, hosted events are for members of The Preserve Ranch and Golf Clubs. For more information about weddings and corporate retreats at The Preserve, please email events@santaluciapreserve.com or call (831) 620-6700. For more information about Preserve Ranch and Golf Club memberships, please email membership@santaluciapreserve.com or call (831) 620-6700. For inquiries about purchasing homes or homesites, please contact The Preserve Land Company via email at plcsales@santaluciapreserve.com or call (831) 620-6762.